When you look at the design of Apple, Samsung, and Google’s latest phones, there’s very little to distinguish this year’s crop from 2017’s has-beens. Meanwhile, outside of the big three, every other phone maker seemed content to jump on the notched screen bandwagon and settle for similarly iterative aesthetics. 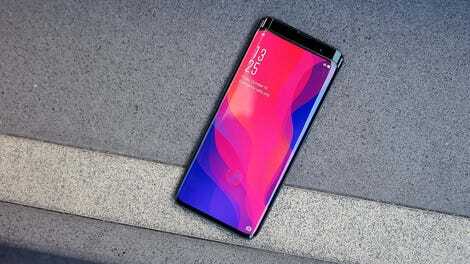 And just when it seemed like 2018 was going to be a truly boring year for phones, Oppo went and made the Find X, a device that simultaneously shows smartphone creativity isn’t dead and buries the idea that there’s no way to avoid those stupid screen cutouts. Photo quality is just OK, too much bloatware, no water-resistance or wireless charging, questionable durability, not available in the U.S.
From top to bottom, the Find X is a vision of elegant simplicity. Its tapered glass sides look and feel great, while the thin black outline that runs along the outside of the display highlights all that unblemished screen real estate like a nice frame on an even better painting. Even on the back, Oppo strives for subtle sophistication with subdued pops of color hidden beneath smokey glass. The only indication of the Find X’s deeper nerd appeal is a slim, crescent-shaped sliver of plastic where the camera would normally be. All these things work together to ensure that there’s nothing to distract you from the Find X’s screen, which is exactly what you want. Featuring a vivid AMOLED panel with a 2340 x 1080 resolution spread across 6.42-inches, the Find X offers one of the most immersive viewing experiences on smartphone yet. The only minor quibble, and I do mean minor, is that the Find X’s peak brightness of 425 nits is 20 to 30 percent dimmer than what you’d get on a new Samsung Galaxy or iPhone. When indoors or in the shade, this isn’t an issue, but if you spend a lot of time staring at your phone outside, it’s not ideal. To get the real fireworks going, all you need to do is unlock the phone or open the camera app to make the Find X’s motorized camera pop open like the secret entrance to a Bond villain’s hideout. Not only does the hidden camera fulfill its traditional picture-taking duties, because the Find X doesn’t have an onboard fingerprint sensor, it also functions as a face scanner so you don’t have to enter your pin 50 times a day. Like the popup headlights on cars from the 80s and 90s, the Find X’s motorized camera will always be cool. Now some folks might get annoyed at the half second or so it takes the Find X’s cam to rise up from its hidey hole. But between the wonderfully techy noise of the tiny motor whirring about inside that sounds like the powered CD trays from desktops of yesteryear and the sheer majesty of watching the phone transform on command, every time I needed to use its cameras, the Find X put a smile on my face. Sometimes, it truly is the small things that make you happy. Unfortunately, even with all this geeky goodness, a respectable battery life just shy of 12 hours and specs that include a Snapdragon 845, 8GB of RAM, and 128GB of storage (along with an upcoming model with a world’s first 10GB of memory), the Find X’s still has a number of flaws. It’s not officially sold in the U.S., so depending on where you get one, the phone may not have important stuff like the Google Play Store pre-installed, which means you’ll need to sideload the APK file yourself. Oppo’s Color OS is also a bit behind the times since it’s based on Android 8.1 rather than Android 9. But the more frustrating part is that phone comes with an entire folder full of bloatware, and by default, its notifications aren’t set to show anything useful, so you need to go and customize your preferences for each app one by one. 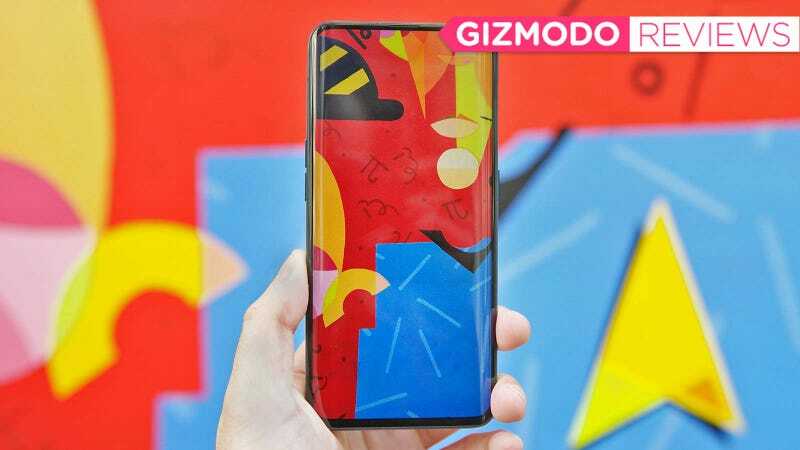 Also, for the $925 or so you’ll need to fork over to a third-party reseller just to buy one, the Find X’s lack of wireless charging, microSD card slot and any sort of water resistance are glaring omissions. And remember what I said earlier about the screen sometimes being hard to see outdoors? Well, the Find X’s issues go even further than that because I feel like for people that are even moderately adventurous, this phone is probably a hard pass. Not only have multiple people demonstrated that the Find X’s chassis is more prone to bending than your typical handset, it’s also not very smart, because if you accidentally try to unlock the while it’s in your pocket, the motorized camera will pop out and struggle in frustration for a few seconds before giving up. Compared to a Galaxy Note 9, the Find X’s pic is blown out and lacks a lot of detail. Once again, the Find X’s pic misses out the brighter colors and captured by a Galaxy Note 9. When the camera is open, you can also lightly shake the phone and hear the pop up slider rattle a bit in its housing. And even though there are cases that work with the Find X, I’d be dubious about any of them being able to provide sufficient protection in the event that the phone gets dropped on its camera. All these things exactly don’t bode well for the Find X’s long-term durability, so here’s hoping they can be refined and improved on future iterations. The image quality from Find X’s cameras are also just OK. The phone never had any trouble recognizing my face when unlocking the phone, but despite offering a whopping 25-MP cam in front and 16-MP and 20-MP cams in back, overall image quality definitely falls short of other devices in this price range. In a head-to-head photo shootout against a Galaxy Note 9 and S9+, the Find X was always a couple steps behind. And while I wouldn’t go so far as to call the Find X’s pictures disappointing, they just consistently lacked that extra level of sharpness and color saturation from pics produced by its competitors. But even with all this, I want to be clear: Flaws and all, the Find X is a captivating device. Oppo could have played it safe and churned out something that may have been more practical or affordable, but it didn’t. 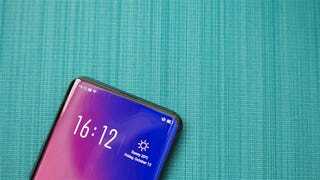 Instead, Oppo took a chance, and in a year when people waged countless internet battles over notches versus bezels, the Find X did its own thing. It delivered the all-screen dream. Now, Oppo has something innovative and unique to build upon. And even when you consider that Samsung could debut a bendable screen phone before the end of the year, there’s no question the Oppo Find is one of the most important smartphones of the year. If the standard Find X isn’t enough, there’s an even louder, and more obnoxious special Lamborghini model. Unless something surprising happens, the Find X will go down as the best-looking phone of the year. Seeing the motorized camera automatically pop up is always exciting, but its design does make it less sturdy than typical flagship handsets. Oppo’s Color OS takes some getting used to and has a whole section of unneeded bloatware. And depending on where you buy the phone, you may need to install the Google Play Store yourself. The Find X isn’t officially for the sale in the U.S., and if you import one, it will only really work on GSM networks like T-Mobile and AT&T.